S.W. Betz is proud to provide our customers with the best products available, made by the highest quality manufacturers. We have many great relationships with the industry’s top vendors, which enable us to find the right solutions for your warehouse needs. This week, we’re shining the spotlight on one of our top vendors: LewisBins+. Read on to find out more about their line of products and how S.W. Betz can help you find the ones you need for your business. The right organizational tools can help your business run more smoothly and be more efficient. Using LewisBins+ for bin storage and organization will allow you to keep different products and materials stored until they are needed for shipment or use. When properly maintained like this, your items will not get in the way of daily warehouse routines or pose a safety hazard to workers. The right kind of storage bins from LewisBins+ can also protect your items from being damaged and make sure that they stay in optimum condition no matter what. S.W. Betz decided to partner with LewisBins+ as they, like our team, are concerned first and foremost with providing customers with quality. 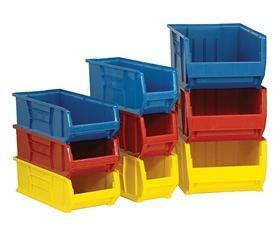 If you are in need of organizational storage bins or related products, get in touch with S.W. Betz today! This entry was posted on Tuesday, February 10th, 2015 at 4:44 pm. Both comments and pings are currently closed.